Elizabeth Emery has been my office manager and personal admin for the past ten years. It’s hard to believe how time flies. In those ten years, she has been an integral part of our office’s quadruple growth in revenue. She is a large part of our success in Houston. As an office manager, she has to know every aspect of the business: sales, operations, human resources, payroll, benefits, service and scheduling. The list is never-ending and Elizabeth is one-of-the- best at CentiMark. Elizabeth is very giving and passionate about her causes outside of work. 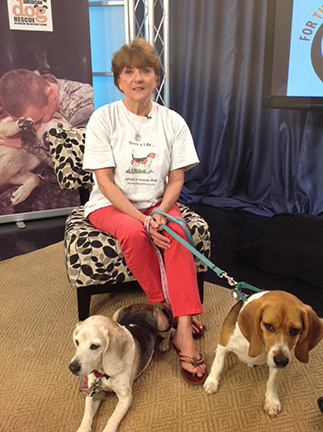 She dedicates a large portion of her free time to rescuing beagles. She loves animals and will never pass a lost, injured or distressed animal without helping anyway that she can. There have been numerous times that I came to the office only to find a dog that she found on her way to work. I look forward to the next ten years of working with Elizabeth and her canine friends. Charlie Hambrick has recently been promoted to Southwest Regional Manager for Arizona, Louisiana, Oklahoma, New Mexico and Texas. He started working for CentiMark 23 years ago as a roofer in Akron, OH. There is very little about roofing that Charlie does not understand. He’s a complicated man that I will never figure out because he is always throwing me a curve ball! He is a complex, yet straight-forward boss. What I admire most about him is his “get-it-done, can-do” attitude. He focuses on the end result to get-it-done: no excuses, no constant updates, just get-it-done. Viable alternatives are accepted because the word “cannot” is not part of his vocabulary. Charlie has high expectations for people to work hard and be their best. He expects the same level of dedication and hard work from his associates as he gives to the job. That being said, one of his greatest strengths is his compassion for people. His extraordinary wife Kimberly provides great support and a strong foundation at home that enables him to excel at work. When the day is done, he has a baby grandson in his life who brings him great joy.